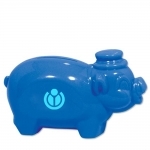 You can bank on these custom imprinted small piggy banks to score a chance with kids and families who stop by your tradeshow stand. 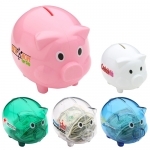 These promotional piggy banks measure 4”x3” and feature a twist plug to retrieve money. 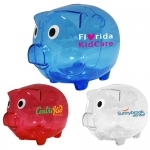 These logo printed colored piggy banks are ideal promotional giveaways for financial services, banks, credit unions, schools, mortgage companies, real estate agencies and more. Available in various interesting colors, you can customize them with your brand logo or brand message before distribution. 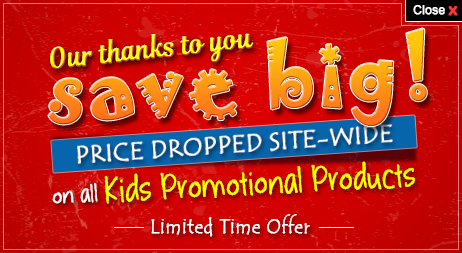 Order today to take advantage of our low price guarantee and free digital design proofs for these promotional giveaways for kids and children. 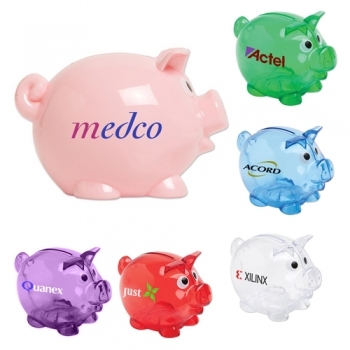 Request a quote to know what you may save on bulk orders of these promotional small piggy banks. 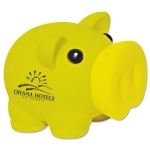 Product Size: 4" X 2 3/4"
Imprint Area: 1 1/4" x 1"